The University of Illinois Fire Service Institute (IFSI) has released the Confined Space Rescue Field Operation Guide (CSRFOG). The handy pocket-size guide was developed by IFSI instructor Ryan Reynolds and the IFSI Confined Space team. The CSRFOG puts valuable confined space rescue-related information, in a durable, easy-to-use format, at the fingertips of the properly-trained rescuer. The book is used as part of IFSI Special Operations Training Program's Confined Space Rescue classes. The book includes fully-illustrated with easy-to-follow photographs and diagrams of specific rigging systems critical to successful rescue operations, including aerial apparatus, ground ladders, and tripods. Entry permits and procedures, size-up, monitoring, ventilation and isolation are covered. It also contains some specific hazards, patient packaging techniques and hazardous materials that are uniquely-related to confined space incidents. 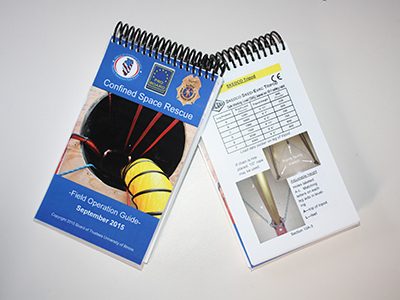 $75 - Confined Space Rescue Field Operation Guide.